The level, range, and type of bass that you will enjoy from your audio system’s subwoofer do not depend on the woofer itself. You will also need a good and durably-constructed enclosure to ensure your subs optimum sound performance. Subwoofers without an enclosure can't deliver full bass because the sound from the back of it can retract some of the low frequencies emanating from the front. Why Does A Subwoofer Need A Subwoofer Enclosure? A subwoofer enclosure is just as important as the sub. Therefore, it should be designed and constructed to match and fit a particular subwoofer that you have chosen. It should be designed in a way that it can reproduce the sound waves generated from the subs to one designated area all at the same time thus creating more focused sound. A subwoofer enclosure also makes sound louder and clearer. Choosing right enclosures will help your subwoofer become the best! How much does the enclosure affect the sound quality? Subwoofer enclosures greatly affect the sound quality of your audio system. For instance, an expensively priced subwoofer with a poorly designed enclosure will sound worse than an average subwoofer with a great enclosure. What is the best choice for an enclosure? You will have a variety of choices when it comes to choosing a subwoofer enclosure as there are plenty of subwoofer options available. There is the ready-made box, mount your sub, and crank out the bass. You may also construct your own enclosure and experience a great bass after successfully making one. A sealed or closed enclosure is simply a box, of any shape, that is air tight. This box does not allow the air to escape when the speaker moves but it is capable of altering the pressure inside it. You just have to calculate the box’s internal volume and with little effort, this can be done. Also, to help absorb the stationary waves created by the back of the woofer and generate better results, you just need to stuff the box with sound dampening material. Sealed enclosures are the smallest so a limited space in your vehicle will not be an issue. An infinite baffle is one where the woofer is installed onto a board or baffle, and the baffle extends in all directions making sure that even the longest sound waves won’t be able to reach the edge. 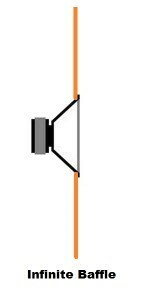 As such, the waves generated by the back of the speaker will never meet the waves produced by the front of the speaker so that there will be no resonances and no diffraction. With a good woofer, this sounds like the recipe for an awesome audio system. The woofer can easily reach maximum excursion so you have to be careful not to damage it. This subwoofer enclosure provides an amazing balance between sound quality, out/efficiency, design, and build difficulty. This enclosure also has a port, which is more often cylinder or rectangle shaped. Higher efficiency than sealed enclosures. 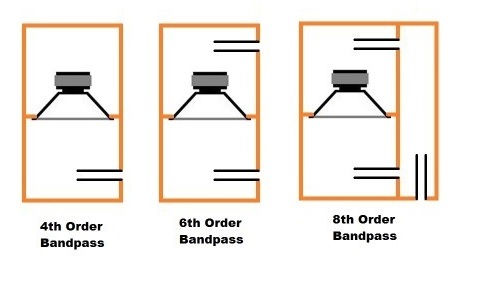 There are several types of enclosures when it comes to bandpass because there is the 4th, 6th, and 8th, order bandpass. In this enclosure, the woofer is out of sight, inside the cabinet and the sound comes out only through the port(s). 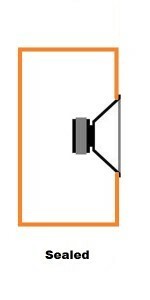 For the 4th order bandpass, one side of the speaker is installed in a sealed enclosure, while the other side is placed in a ported enclosure. 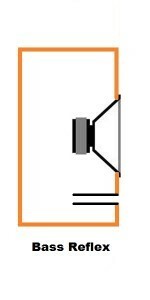 In this enclosure type, the woofer plays louder than bass-reflex. The 6th order bandpass has both chambers ported, while 8th order bandpass comes with an additional ported chamber.